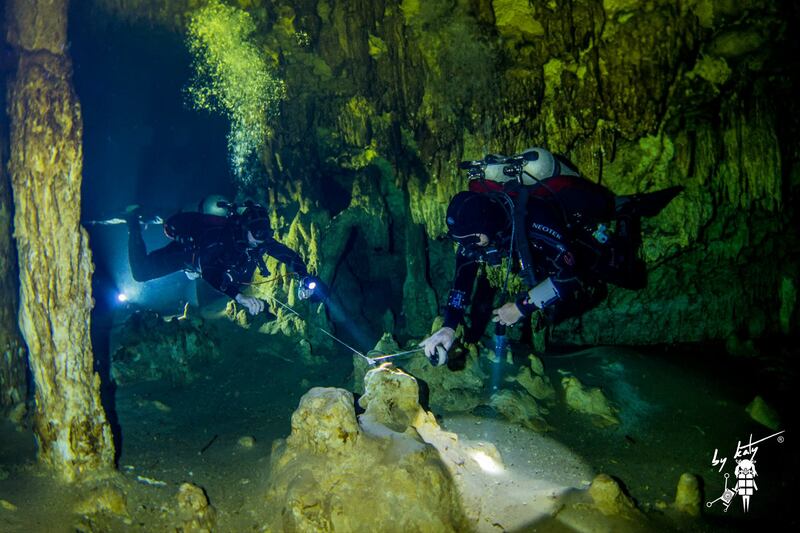 Kris Harrison and Markus Teupe making a jump in cenote ‘El Toh’, Mexico. Katy took this great photo in a ‘little’ cave called ‘El Toh’. We picked this cave because it’s a beautiful white cave with room to move for all of us and our cameras and lights but not so big that the cave would swallow all of our lights. Filming in a cave environment takes planning, precision, a group of experienced cave divers and the more lights the better! Dive planning and preparation for a video shoot. I had a lot of fun today and we already quickly browsed through our footage and it looks like we have some great shots in there. Now it’s up to Katy to edit the whole thing in a few minute promotion video.